The Steam Boat Enterprise. Built in 1814 at Brownsville, PA. 75 tons displacement, about 40 tons cargo capacity. The first steamboat to journey up the Mississippi and Ohio Rivers from New Orleans, LA to Pittsburgh, PA to Brownsville, PA.
Few historical references cite the role played in the Battle for New Orleans by the steam boat Enterprise. I was under the impression Shreve and the Enterprise arrived at New Orleans on 9 January, 1815, the day after the British main attack. Then I found better sources! The Enterprise not only arrived on 14 December, over three weeks before the British main attack, but it participated in the defense of New Orleans, making it the first use of a steam powered ship in battle. The Enterprise used a medium-pressure steam engine designed by Daniel French. This was smaller and simpler than Fulton’s low-pressure engines, and gave the Enterprise an extremely shallow draft and a much faster speed in the water. Just a handful of US Navy ships were named Enterprise, but it was a very common name among civilian-owned merchant ships. 1. The Fulton-Livingston monopoly of steam boat travel on the Mississippi was not a natural monopoly, but one granted by Congress. It was very unpopular with the western states, particularly farmers and small businesses who were forced to either build flatboats to carry goods to New Orleans or pay the Fulton-Livingston consortium. Shreve’s defeat of this in court made him a hero, and within years there were hundreds of steamboats on the Mississippi-Missouri-Ohio rivers. 2. Shreve’s performance at New Orleans endeared him to Andrew Jackson. After election as president, Jackson appointed him superintendent of Western waterways. 3. 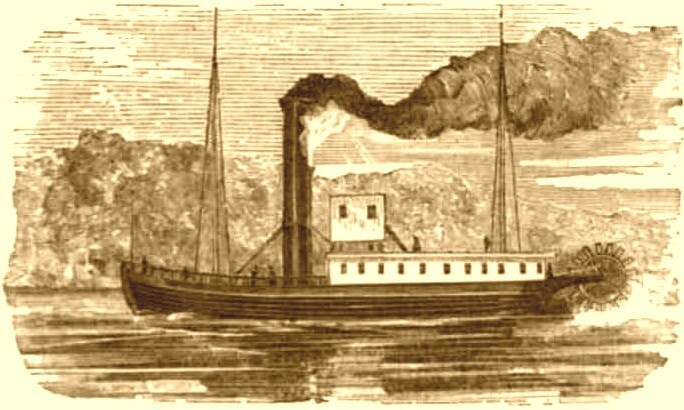 As superintendent of Western waterways Shreve designed and built snag-clearing steamboats that were able to cut paths through the great rafts of logs clogging many of the western rivers. When he cleared the Red River of its 180-mile long logjam, the City of Shreveport was named in his honor. Note – the Great Raft wasn’t completely cleared until the 1870s, so there are pictures of it online. 4. When Shreve returned to Pennsylvania in 1815, he designed and even better engine and built the Washington, the largest, fastest steamboat on the Mississippi for several years. The cabins within the Washington were named after states of the Union, and this is generally considered the origin of the word “stateroom”. Displacement: 75 tons. About 40 tons cargo capacity. Engine: Daniel French medium pressure steam engine. Owned by the Monongahela and Ohio Steam Boat Company. Built at Brownsville, PA, in 1814, under the design and supervision of Daniel French. 1 December, 1814 – Shreve sailed the Enterprise from Pittsburgh to New Orleans, loaded with a cargo of ordnance and ammunition. 14 December, 1814 – Arrived at New Orleans. Jackson seized boat for use in defense of New Orleans. 15 December, 1814 – Jackson sends Shreve upriver to locate three keel boats lost upriver. 22 December, 1814 – Shreve returns to New Orleans with keel boats in tow. ~25 December, 1814 – Shreve ordered to carry women/children upriver to safety. ~27 December, 1814 – Shreve sailed the Enterprise up the Red River and reached the rapids above Alexandria. 4 January, 1815 – Shreve sailed the Enterprise down river, past the guns of the British, to deliver supplies to Fort St Phillips. 5 January, 1815 – Again sails up river, past guns of British, to return to New Orleans. 8 January, 1815 – Shreve volunteered to serve as an artilleryman in a battery commanded by Colonel Humphrey. Helps defeat British main attack. March, 1815 – Jackson receives word that Congress has ratified the Treaty of Ghent, and lifts martial law. The Enterprise is immediately seized by Edward Livingston, a New Orleans attorney and younger brother of Robert Livingston, of the Livingston-Fulton monopoly. 6 May, 1815 – Released until trial can be held, Enterprise sailed from New Orleans bound for Pittsburgh. The entire journey took 54 days, 34 days of actual travel, 20 days loading and unloading cargo at different towns along the way. 26 May, 1816 – Shreve and Enterprise defeat Livingston & Co in court. This destroys the Fulton-Livingston monopoly for Mississippi steam boat travel. Steamboats on the Western Rivers: An Economic and Technological History by Louis Hunter. Wikipedia – Enterprise(1814) This site has the correct picture, but they get many of the facts wrong. 1 Dec – Shreve sailed the Enterprise from Pittsburgh to New Orleans, loaded with a cargo of ordnance and ammunition, arriving at that port on the fourteenth of that month. This was written by Neil Garra. Posted on Friday, April 1, 2011, at 20:14. Filed under Technology. Tagged Historical. Bookmark the permalink. Follow comments here with the RSS feed. Both comments and trackbacks are currently closed.